“He is just like his father—-all crazy dreams and impractical schemes” says Sarbojaya about her son Apu to his uncle. “Aparajito” (Unvanquished), the second part of the Apu Trilogy and thematically the most nuanced, is about Apu’s aspirations. Apu is now in the cusp of boyhood and manhood–gawky, dissatisfied and increasingly feeling constricted by his rural surroundings. On one hand is the strong pull of tradition—–his mother and his elders want him to continue the family profession of priesthood and stay in the village. And on the other hand is the desire to break free. “Aparajito” chronicles the awakening of Apu’s mind and the conflicts it brings in its wake. While “Pather Panchali” depicted Apu as an intrinsic part of his pastoral surroundings, “Aparajito” marks his gradual detachment from nature and from the things that used to enthrall him previously. The entertainers in the village fair bore him, he grudgingly performs the priest’s responsibilities (note the scene where he comes back from Puja and rushes off to play—though you cannot see it you can hear the loud sound of him dumping the “Narayana Sila” with singular lack of veneration), and once he goes to Calcutta for higher studies becomes increasingly disinclined to come back to the village even for a few days. “Aparajito”‘s depiction of the mother-son relationship came for some criticism when the movie was released—-many Indians, used to picture-perfect familial bonds on-screen, could not come to terms with the gradually increasing aloofness on the part of Apu from his mother. Sarbojaya is petrified of losing her son to the city. Widowed and alone, she clings to Apu as her only support and the more she does that, the more stifled does he feel and moves way. To Apu, his mother’s dotingness symbolizes the constriction of village life—paradoxically feeling more claustrophobic in the open spaces of Arboal than in the dingy printing press in which he works in Calcutta. It is this growing distance between mother and son which is , in my opinion, the most heart-rending part of the movie. Alone in the village, Apu’s gradually infrequent visits become Sarbojaya’s only lifeline. But for Apu it is just a duty he has to discharge. In one memorable scene, Sarbojaya talks about wanting to see Calcutta and of how her health has been failing—-only to turn around and find that Apu has fallen asleep. In another unforgettable scene which shows that Apu also loves his mother but just is not comfortable expressing it, Sarbajaya pleads with Apu to stay, Apu brushes her off rudely, goes to the train station and cannot bring himself to board the train, comes back and tells his mother not the truth…..but that he missed the train. Karuna Banerjee as Sarbojaya gives a tour d’force performance —–in one evocative scene , dying and alone, she hallucinates that Apu has come back. Her eyes light up with joy and she rushes out to the empty village path and the light that shone in her eyes gradually dims out as she realizes that noone is coming. As an aside: Bibhutibhushon Bandopadhyay’s depiction of the growing distance between mother and son in the original novel was even more brutal. There after Sarbojaya has passed away, Apu comes back and feels extremely happy——-happy that all the bonds with the village have been broken irrevocably and that he is free at last. Only when he sees the pickle jars and realizes that there is noone to prevent him anymore from opening and eating them, that he breaks down and starts sobbing disconsolately. In someone else’s hand, “Aparajito” could have become morose and pessimistic. But not Ray’s. With his typical sense of understated humor, he infuses a dark movie with luminant characters and situations—-the school inspector, the college professor and of course, the devil-may-care Pulu, Apu’s best friend in Calcutta. Darker and more disturbing than the other installments of the Trilogy, “Aparajito” is not everyone’s cup of tea. But it’s still a masterpiece. In someone else’s hand, “Aparajito” could have become morose and pessimistic. But not Ray’s. I often compare styles and innate emotions of Satyajit Ray, Bimal Roy and Guru Dutt (my favorite 3 filmmakers), and Ray always has that optimistic light shining through, while Roy tended to portray things in more or less black or white, while Dutt was always only grey. So much to see, learn and admire from the three of them…..
I’ll post on that sometime….when my thoughts get organized…..
BTW, I found your take on the Apu-Sarbojaya relationship in Aparajito interesting. 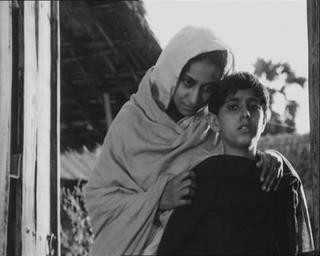 The great critic Robin Wood (who wrote some of the finest essays on Hitchcock films) mentioned that Pather Panchali has a few cues which indicate that Apu will eventually break away from his mother’s way of life and head down the modern road. Some prominent Indian critics (including T G Vaidyanathan) took umbrage to this observation, retorting that, as a westerner, Wood “had no understanding of the deep bonds between mothers and sons in India”. (Which is an offensive statement in its own right, I think.) But the book and the film do in fact bear Wood’s thesis out – though he loves his mother in his own way, Apu is straining to break free. Two things. When you quote: “We may be rooted in a remote corner of Bengal but that does not mean our mind should be confined here.”, I think it’s apt to credit it to a recurring theme in Bibhutibhusan’s novels – of letting off the mind’s fetters rooted and grooved in Bengal. Cf. – “Chader Pahar”. Also, I thought that the doting mother represented Ray’s own mother in certain ways. Possibly he personified Apu too much to give the film the unabridged ending. Btw, have you guys seen ‘Jono oronyo’? In lots of ways, I find it to be the least artistic, yet the most ruthlessly scathing of all Ray’s movies. i simply love your blog..
@Jabberwock…thanks. TG Vaidyanathan echoes the sentiment that made audiences a bit uncomfortable—“Aparajito” goes against the grain of the traditional “Mere Paas Ma Hain” kind of relational escapism we are so proud of. @Satchisgod. True—and am I the only one who feels “Congo” is partially inspired by “Chaander Pahar” ? Yes I have seen Jono Oronyo—-ruthlessly scathing no doubt but I have issues with Satyajit Ray’s “naivette” in understanding “city life”—something which I look fwd to blog on in the future. @Danica…Thanks for your appreciation. And this is a really nice way to publicize “adult sites”—except that maybe you could have tried some other post of mine (rather than a review of “Aparajito” ) to tag your generic comment to. well said. imho, this shows up most transparently in agantuk. my attitude towards that film has changed significantly over the years. when i first saw it, i was drawn into the mystique of utpal dutt’s character, and could not help but admire the weight of experience that spoke through it. upon repeated viewing, i have come to regard the agantuk as much too defensive, much too eager to justify his life choices. from a man whose horizons are not constrained by the ties of samsara and who seems to have had enough time and opportunity for soul-searching, i would have expected fewer words and a silent, benign compassion (even towards the obnoxious lawyer friend), rather than vociferous lectures about civilization. Point taken. But the prodigal uncle is a product of a civilized upbringing…though he admires the tribals he is still saddled with his social context. Hence the need to defend his own choices often fairly heatedly. When I said “naivette” I meant things like Ray actually believing that the mention of the word “black money” would make any businessman, no matter how honest, have a heart attack (Shakha Prosakha)……….there are countless such instances in his movies…. Again I shall discuss it all in a subsequent post. 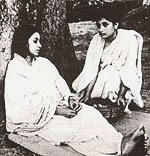 More than a few well-known auhtors of Bengali literature have expressed their helplessness in trying to control their creations or the way the stories ended: Rabindranath regretted Binodini’s fate in Chokher Bali, Sarat Chandra was ashamed of Devdas…but the beauty of BB lies in the fact that he was concious of the way Apu’s emotional detachment from his mother was potrayed in the novella without any excuse and later brilliantly handled by Ray on screen. As we will see in Apu-r Sangshar, the bohemian Apu isn’t totally detached from the sweet dreams of having a happy nest…the reason he got married to Aparna amongst circumstances not very congenial..and then his violent outburst when he was conveyed the news of Aparna’s death during childbirth and his prolonged estrangement from his own son…Apu is a classic case of the duality in human nature that intrigues Kafka, Sartre and many others from time to time…you give him what he wants and he will denounce it then and there and then when you think he is beyong all worldly desires, he comes back hungry for more! Arnabda, baki movie gulor review o ebaar likhe phelo ek ek kore. Have you seen WOng Kar Wai’s movies. I am sure you have .. how about a post on that. The apu series of articles on ur blog is breathtaking, each time i read it .. gives me the goosebumps.